While the rest of the market surges, Ripple continues to trade sideways, moving only 6% in the last 30 days. For comparison, over the same period, Bitcoin is up 13%, Ethereum is up 29%, Litecoin is up 70% and Binance Coin is up 110%. 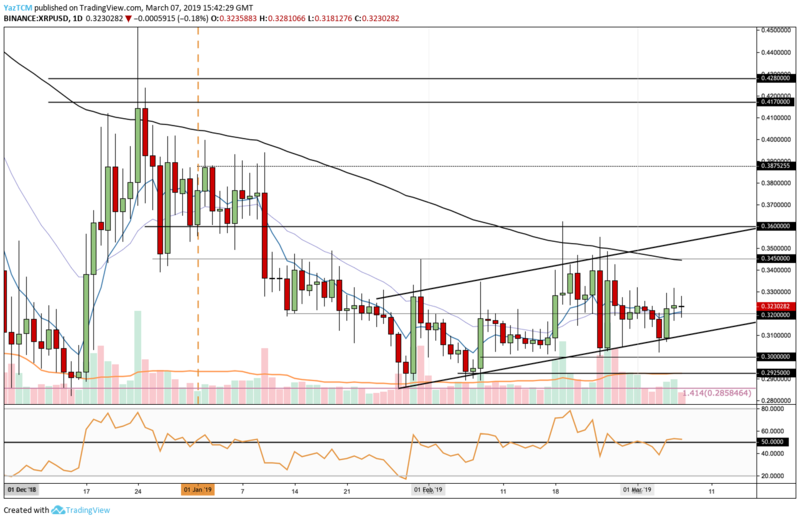 Despite this sluggish market movement, Ripple continues to trade within a wide ascending price channel and a break above the $0.33 could see a potential surge toward the top of the trading channel around $0.36. Ripple remains ranked in 3rd position as it currently has a $13 billion market capitalization. XRP, which is one of the oldest cryptocurrencies that have remained relevant to this day, is currently trading 91% below its all-time high price. We can see that during January 2019, the market had descended from a high around $0.38 into support around the December 2018 price low at $0.2860. After rebounding from this support, XRP/USD had started to trade within the highlighted price channel until today. The market met resistance at the upper boundary of the range toward the end of February, and proceeded to roll over. However, the lower boundary of the range has recently acted as support once again and turned the market upward. XRP/USD is now trading above support at the $0.32 level which had provided strong support during January 2018. The current short term trend remains neutral until price action can break above the $0.33 level. For this market to be considered bearish, we would need to see price action drop beneath the lower boundary of the range and below the $0.30 level. If the bulls can regroup their efforts and start to push the market higher we can expect immediate strong resistance above to be located at the $0.33 level. Further resistance above $0.33 is located at the $0.3450 level which is further bolstered by the 100-day moving average. If the buyers continue to drive XRP/USD above $0.3450, we can expect more resistance to come into play at the upper boundary of the ascending price channel. Resistance above the price channel lies at the $0.36, $0.38 and $0.3875 levels. Alternatively, if the bears start to increase the pressure and push XRP/USD lower, we can expect immediate support beneath to be located at the $0.32 level. This is followed up with more support at the lower boundary of the ascending price channel. If the sellers push the market beneath the price channel, further support then lies at the $0.30 level. Support beneath $0.30 can be located at the $0.2950 and $0.2858 levels. The RSI is currently at a stalemate as it trades along the 50 level which indicates indecision within the market. If the buyers can take over the momentum and push the RSI above the 50 level, we can expect the market to break above $0.33 and head towards the top of the price channel. The market is currently above both the 7-day and 21-day EMAs, but the buyers still have to face the 100-day moving average, which currently lies at the $0.3450 level, if XRP is to go on a bull run. Previous articleAre Bitcoin and Ethereum Cryptocurrency Compound Interest Rate Earnings a Gamechanger?